In mid-December we trekked into the Coast Range for our traditional family debate on the qualities of various young evergreens. This discussion is complicated because the tree must serve the conflicting needs of fitting into a small living room while holding an adequate number of ornaments. We deferred on the argument and visited the spring that waters the old house on the flat. Water spurted from the overflow pipe at the springhouse. But at the intake pool further up the draw, only a dribble of water cleared the retaining wall. The flow was every bit as small as it had been in late summer. Even now, after the return of earnest fall rain, most of the spring remained hidden, drawn like a cool salamander somewhere into the depths of the sandstone ridge. I felt a small tightening just below my throat. December is historically one of our wettest months, coming on the heels of our second-wettest month. Yet there was so little water. These mountains hold the ultimate water rights, but in all our years here they have never withheld the gift. For a few moments I imagined a summer when the trickle and splash in the draw would become silent as sand, the springhouse holding only cracked sludge on the bottom. The water would disappear after the garden had already grown after three months of luxuriant dependable water pulsing and hissing from an oscillating sprinkler. What then? We resolved our good-natured conifer debate and picked out a tree, then Kim and Laurel hit the road for commitments in town. I wasn’t ready to go. The fall chanterelle crop had been nonexistent because the October rains had been delayed, then delayed even longer, until finally they became November rains. Even after the first serious soakings, there had been no mushrooms. Surely by now the chanterelles would be up. Nearby was one of my tried-and-true places, a stand of closed canopy second-growth Douglas-fir. A few russulas and boletes were up. There were also a few chanterelles, and I was grateful to have them. But the dearth of mushrooms told me that the mycelia from which they grew had been baked by yet another shriveling summer and dusty fall. In this part of the Coast Range, high temperatures and low moisture are exacerbated by occasional bouts of heat bulging northwestward from the hot southern Oregon valleys, heat that isn’t ameliorated by elevation or proximity to the cold Pacific Ocean. My favorite foraging places have also been hit hard by local forest practices. New clearcuts on private land are interspersed with Bureau of Land Management “thinning” projects. The remaining trees are so far apart that protective shade formed by the canopy is fragmented, and full summer sun scorches the forest floor. Moisture-loving microbes and fungi that proliferate in damp forest soils are doomed. I could adjust to these changing circumstances. My friends tell me that further north and west the mushroom harvest is considerably better. But I am compelled to tell the story of my home ground, the story of mushrooms disappearing in the face of more frequent scorching summers and forests managed under the single-minded metric of board feet. After gathering a couple of hard-earned pounds of chanterelles, I was drawn to the canyon bottom. The coho should have returned to spawn in the small creeks high in the drainage. In honor of my late friend Jerry, I connect annually with these spawning fish. Pushing through vine maple, sword fern, and salal, I drew near the creek in the vicinity of a redd Jerry had shown me years ago. In the wet brush, I paused to listen for the paddle-like thrashing of a hen salmon’s tail hammering silt from sandstone gravel. Silence. I moved to the streambank and stared into clear water. The creek bottom was strewn with big leaf maple leaves covered with a thin layer of silt, completely undisturbed from their fall resting places. The mountains were thirsty. All of the rain had been retained by dry duff and empty spaces in sandstone aquifers. The spring above the house had already told me what I should have expected. There had been no cleansing surge of water. There were no salmon. A silent shrug rose into my shoulders. If the spring at the house vanished fully into the mountains, I would carry water from the creek on the valley floor and hope for wetter years. Douglas-firs grow quickly. The chanterelles have recovered from previous droughts. 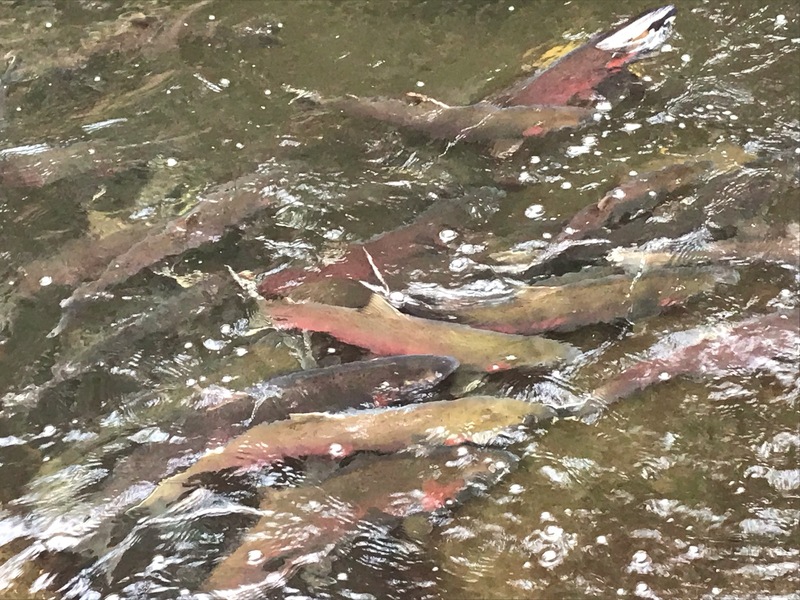 This year, deteriorating flesh and the ache of eggs probably caused the coho to spawn in larger water downstream. Yet that silent shrug of resignation and practicality carries both our salvation and our damnation. I have an endless upwelling of shallow solutions to immediate problems. I am stalked by evidence for this unfolding emergency: trailing blackberries reach peak fruit two weeks earlier, August crickets sing in July, drought-killed firs stand dead on their feet in the foothills. But I can’t seem to access deeper aquifers of feeling that will allow me to fully embrace our withering planet, especially when most of the withering is a continent or a century away. This isn’t denial. I just don’t connect emotionally. So I’m forced to think my way through this slow-motion disaster, forcing my mind to find a way to embrace it, to behave differently. This is not easy. A few days later, darkness enveloped suburbia. A blessed torrent of rain began, pummeling the skylight and back awning, drowning all manner of annoying suburban sounds: barking dogs, passing cars, squalling cats, an occasional raccoon running across the roof. I opened the window above my bed. The sound of falling water pressed in around my head, my head that imagined an ensuing flush of spring water, a swell of mycelia, a coho’s tail thrashing through small riffles finally deep enough to carry a salmon who had waited too long to get there. In the darkness, my brain nestled into the gentling sound of rain. But still I wondered—how long will the things I love persist?